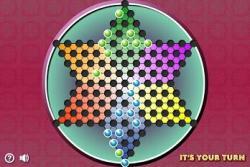 This beautiful online Chinese Checkers game trains strategic thinking and analytical ability. Up to six players can compete at the same time in the original Chinese Checkers board game. In this online version, it's just you versus the computer. To begin, click the Small, Medium, or Large link or PLAY GAME button under the picture at left. This opens the game in a pop-up window. If you like this game, you might also enjoy my Free Internet Checkers, Marble Solitaire, and Checkers Online Game pages. HOW TO PLAY. Compete against the computer to move your marbles to the enemy base as quickly as possible. The aim of this Chinese Checkers game is to move all your blue marbles from your blue base to the opposite green base. The board in the original game is a six-sided hexagram often stamped in metal. The game is played with real, solid-color marbles. This two-dimensional online Chinese Checkers game emulates that. To move a marble, click the marble then click the spot you want it to jump to. An arrow shows your jump direction. After the computer's turn, click the "CLEAR MARKS" button in the lower right corner to clear the computer's arrow before making your next move. A marble can make consecutive jumps to speed up movement, so you need to strategically place your marbles so that your other marbles can make long consecutive jumps. At the same time you should also try your best to block the jumps of the computer. A marble can move to an adjacent space. After jumping over a marble, the marble can jump over another marble again. A marble cannot end its move on a base other than its own or its enemy's. But it can jump into it and then jump out immediately. When jumping over a marble, you can jump two or more spaces to get over the marble, as long as the number of empty spaces on each side of the marble being jumped is the same. For tips and hints on strategy, see my Chinese Checkers Strategy page. I hope you enjoy this free online Chinese Checkers game! Chinese Checkers is not an ancient board game like chess or backgammon, but it has been around for over 100 years. I first remember playing it as a child in the 1970's. Although called "Chinese" Checkers, this board game was not invented in China or anywhere in Asia. It was actually invented in Germany in 1893. The game is also sometimes referred to as Chinese Chequers. Chinese Checkers was originally called "Stern-Halma", the Stern meaning "star" in German and Halma referring to the name of the American game from which it was derived. The name "Chinese Checkers" itself was assigned by the Pressman company in 1928 as a marketing scheme. 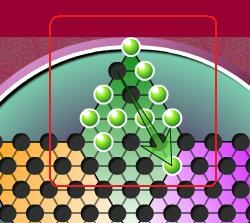 This online Chinese Checkers game follows hop across rules. In the board game, you can alternatively play by capture rules which is similar to the game Marble Solitaire. Under capture rules, marbles start in the hexagonal space in the middle, with one marble left out in the center. Players take turns hopping over game pieces, taking the marbles they jump over off the board. The player with the most captured pieces at the end wins. Game distributed by ProProfs.com. Used with Permission.